I am in hopes that your frets are in fair shape. If they are badly worn, you may want to have them replaced. If you have been experiencing fret buzz and your frets are badly worn, this may be the reason for it and not the action of your guitar. A quick reference for checking the neck’s alignment with the bridge is to place a carpenter’s square on the frets of the neck and see if it lines up with the bridge (as seen below). Just be sure that it isn’t on the nut. It should only be on the frets of the neck. 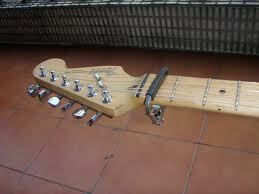 You don’t need to do this, it just gives you a quick reference as to how far out of wack your guitar might be. We will be doing much finer adjustment than this will accomplish. To view the relief in your neck, push your 6th string down on the first and last fret of your guitar. 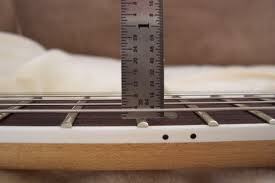 Approximately half way between the two, your string should be off of the fret. The distance from the fret to your string is the amount of relief that is in your neck. If the string is against the fret, then there is no relief and you were probably experiencing fret buzz at some places on your guitar (if not everywhere). Note: You can free up one hand if you place a capo on the first fret of the guitar. A real help when trying to measure the relief. To measure the amount of relief, they say to use a feeler gauge. You can try to use a scale if you don’t have any feeler gauges, but the gauges are more reliable. Below is a standard for how much relief you should have. I personally don’t fit the standard. The standard is just a starting point anyways. You should set it to what feels natural for you. Some people like it higher and some like it lower. Once again, this is just a starting point. Next we will discuss how to obtain this desired relief in “Adjusting the Truss Rod“.